She doesn't know him. But he knows everything about her. Seven years ago, the wealthy businessman Philipp Petersen disappeared without trace while on a trip to South America. Since then his wife, Sarah, has been bringing up their son alone. Then suddenly, out of the blue, Sarah receives news that Philipp is still alive. The return of the presumed abduction victim becomes the centre of a media hype. 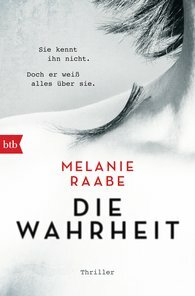 "The German answer to Gone Girl."